Cape Town - Ireland have replaced Australia in third place in the World Rugby rankings thanks to the Wallabies’ heavy defeat at the hands of Scotland at Murrayfield on Saturday. According to World Rugby's website, the 53-24 scoreline resulted in a loss of 1.8 rating points for Michael Cheika’s side, to leave them on 85.49 points - nine-tenths less than Ireland whose total stays at 86.39 after a 28-19 home win over Argentina. New Zealand’s 33-18 win over Wales in Cardiff sees them preserve their 3.12-point advantage over England at the top of the rankings heading into 2018. The All Blacks are unchanged on 93.99 points, while England stay on 90.87 points as no points were on offer for their 48-14 victory against Samoa because of the points difference between the two. Scotland countered the loss of star fullback Stuart Hogg in the warm-up to rack up a record score against the Wallabies, Byron McGuigan making the most of his late promotion to the starting XV with a brace of tries. 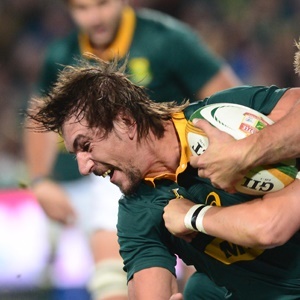 The result did not affect their rankings position, however, as the Springboks’ 35-6 win over Italy in Padova meant they kept hold of fifth. The gap between the two is now only 0.79 of a point though. Despite their loss to Ireland, Argentina gain a place and move into eighth at the expense of France, who could only draw at home to Japan. Shintaro Ishihara crossed with seven minutes to go to level the scores at 23-23, but the Brave Blossoms were denied another famous win, following on from their victory over South Africa at RWC 2015, when Yu Tamura missed the simple conversion. Even so, Japan’s rating goes up to 75.66 points, on the back of a 0.68 of a point gain. Japan continue to be ranked 11th, behind Fiji who saw off Canada 57-17 in Narbonne. Eight different Fijian players got their names on the scoresheet plus they were awarded a penalty try. Georgia survived the loss of points by the skin of their teeth after the USA pushed them all the way in Tbilisi before losing 21-20. Tonga’s terrific 25-20 win over Romania in Bucharest lifts the ‘Ikale Tahi up two places to 13th, relegating Italy and Romania in the process, while Hong Kong are also on the up, to 22nd, after Namibia’s second loss in as many weeks to Uruguay dropped them below the Asian side. Having been beaten 52-36 in the first match, Namibia were far more competitive second time around, matching Uruguay try for try, but the goal-kicking of wing Federico Favaro ultimately proved the difference as Los Teros squeezed home, 39-34, to take the series 2-0. Uruguay stay in 18th place but with an improved total of 65.63 points.